Insanely Brilliant? Or Brilliantly Insane? By any estimation, many of the investigators on television have flashes of brilliance. Whether it’s street smarts, understanding people better than most, or just plain book knowledge, heroes on television use their brains to figure out the most impossible mysteries. But when it comes to putting together the clues, their level of intelligence pales in comparison to Austin James, the lead character of a 1988 ABC television series called Probe. And Austin James was either the smartest man in the world… or he was justifiably crazy. And no one could really tell which description was true… except maybe Austin himself. 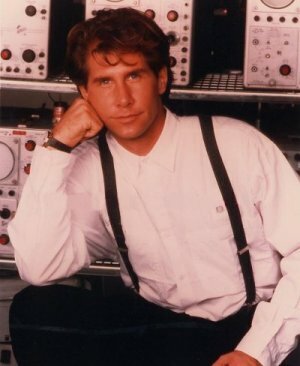 Parker Stevenson starred as Austin James, a scientist and inventor with an intellect that would make most geniuses jealous. He set about each week to discover the answers to offbeat mysteries, aided by his assistant/secretary Michelle Castle (Ashley Crow). Known as “Mickey”, she was the duo’s heart paired with Austin’s intellect. They were drawn into the strangest of stories, detailing unusual, scientific crimes and odd situations that only Austin’s brainpower might be able to understand… and only Mickey might be able to lead him to, through the unpredictable maze of human behavior. Austin had started a company, Serindip, designed to be a home for the most cutting-edge scientific developments of the era… and then he walked away from it. He lives in a combination workshop/lab, sleeping in a cabinet (which he refers to as an “isolation chamber”). Mickey, of course, doesn’t understand any of this, but she’s never met anyone quite like Austin. Rather than return to her previously humdrum life, she takes on the role of assistant to either the most brilliant person she’s ever met… or a certifiable crazy man. She’s just not sure which yet. Back at Serendip, Austin has left Howard Millhouse (Jon Cypher) in charge. Howard is trying to hold the place together, but would like the attention of Austin at the think-tank, given Austin’s formidable intelligence and what he could offer. (Besides, it IS Austin’s company in the first place!). But the more pressure Howard puts on Austin to be part of the organization he created, the more Austin tries to find other uses for his time… like solving practically impossible murders. Austin’s fellow scientist Graham McKinley (Clive Revill) also is employed by Serendip, but is much less able to think “out-of-the-box” like Austin. The friction between the two also serves to force Austin into directions that wouldn’t always be considered “normal” by most. But then, “normal” wasn’t what Probe was all about. Probe was a co-creation of mystery writer William Link (of Colombo and Ellery Queen fame) and prolific science fiction/fact author Isaac Asimov. Both men wanted to show that the modern mysteries of our scientific and technological world could be just as entertaining as a traditional parlour mystery, just moved forward into the new millennium. Their result was a show featuring the most intelligent person in the world, solving some of the most amazing puzzles ever created. Austin is, to most observers, kind of peculiar. He was a man who had no use for money, or fame, or any of a myriad of things that many hunger for. He had few of the motivations of most men. To him, knowledge was all… and anytime there was a mystery, it was then Austin was finally moved to action. For a man to whom the intricacies of the world could be reduced to equations buzzing around in his head, a true puzzle was that which seemed not to have a rational answer. Like Sherlock Holmes, he may have not been understood very well, but that was no knock on his adeptness at figuring out impossible situations. When people were murdered on this show, you couldn’t just round up the suspects like a traditional Agatha Christie mystery. Especially when the suspect in the pilot turns out to be a computer program run amok. Or, as in a later episode, when an advanced ape is being framed for killing one of its handlers. These were unusual stories, with an unusual hero at the forefront. 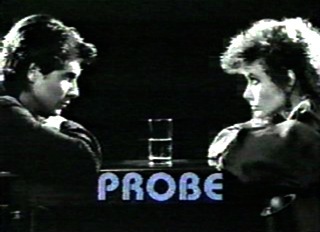 Probe could very easily have resulted in a television series that was dry and far over-the-head of most people, but the creators realized that problem early on, and set out to fix it with humor. “We had to go back and reshoot about a third of the pilot for a number of reasons. It was too strong, it was too intense… the fun of it went out of it, and the fun of it couldn’t go out of it because it wasn’t a serious show, it was a fun show. 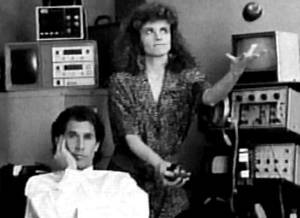 Austin was played by the familiar and likeable Parker Stevenson, but the character of Austin James, as developed, was SO “out there” that he wasn’t the most relatable lead on television. The character’s attitudes came from advanced science and knowledge of facts (Austin had attended college at age 10), but the very intelligence that made him sought-after as the creator of the Serendip consulting organization was also the very same thing that kept him from being part of it. His skills at interacting with people were almost non-existent. That’s why he needed Mickey, even if she didn’t always understand his behavior. He came off to those around him as arrogant, or aberrant, or sometimes just plain crazy, although he was none of these things. But extreme intelligence in a world of “average” looks that way to the average. Perhaps the creators aimed a bit too high… as the modern-day success of the cable series Monk has shown, audiences will respond to a character who seems a bit far afield, if they can recognize parts of themselves in the portrayal. But on Probe, the lead was, almost by definition, light-years ahead of the normal person, while Adrian Monk is portrayed as someone both gifted and cursed with his condition. Monk was once “normal”, while Austin never had been, and perhaps that led to a bit of distance for that “average” viewer. Monk presented a more acceptable “crazy”. Austin James NEVER turned his mind “off”. He even commented once about someone interrupting his few hours of sleep every day, because even then, he was using his mind to puzzle out some conundrum. Many thought he was nuts (or at the very least abnormal). As presented on Probe, he was the hero we were meant to identify with, albeit flawed somewhat emotionally. But the important thing is, without the knowledge, he wasn’t even “average”, and if I’m going to have a champion to cheer for on a show, it’s one with brains and a little help in the heart department rather than one with much lesser intelligence. Because, those with brains are always seeking more — and those with less are satisfied with enough. I’d rather have more…. The Cosby Show was the number one series on television at the time, so ABC had to take some risks in trying to challenge it. But ABC did Probe no favors in its promotion. They touted the involvement of Asimov significantly to the press, believing it to be a significant selling point for the series. (Asimov had written over 200 books, both fiction and non-fiction, and this was his first significant journey into the realm of television.) Unfortunately, a great many people took this as meaning the show was simply too highbrow, too focused on the intelligence the viewer brought to the table, and didn’t tune in. 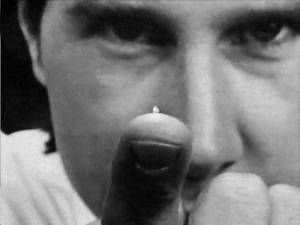 The advertising made the show out to be either “silly” science fiction (in the vein of much earlier television) or “too intelligent” and something that would be better found on Public Television. Truthfully, Probe presented a much more accessible adventure, if only more of the public would have sampled it. But they didn’t, and unfortunately that led to the demise of Probe after seven episodes. The series was many good things, but it almost certainly was not what most people thought it to be originally. Like Austin James, Probe was sorely misunderstood. PARKER STEVENSON (Austin James) first came to fame (and teen idol status) as Frank Hardy, one of the sleuthing brothers on The Hardy Boys/Nancy Drew Mysteries. Other regular/recurring television roles included North and South Book II, the original cast of Baywatch, and Melrose Place. His birth name is Richard Parker, but he was forced to change it when another actor by that name was already registered with the Screen Actors Guild. ASHLEY CROW (Michelle “Mickey” Castle) was a regular on both short-lived series Champs and Turks. She’s best known by genre fans as Sandra Bennet, the wife of the man known as HRG (for “Horn-Rimmed Glasses”) on Heroes. She’s set to play the grandmother of the lead character Cassie on the new CW series The Secret Circle this fall. JON CYPHER (Howard Millhouse) was a fixture on television in many series, including Knots Landing, Dynasty, and the soap opera Santa Barbara. He played Police Chief Daniels for the entire run of Hill Street Blues, and appeared as the General to Major Dad. He was also active on Broadway, especially in musical like 1776, Man of La Mancha, and Big: the musical. CLIVE REVILL (Graham McKinley) is originally from New Zealand, although he’s played everything from British to Chinese to Russian in his lengthy career. A Shakespearean actor of some note, he’s also been in numerous comedy films. earning a Golden Globe nomination for his role in the movie Avanti! He will be seen on this site again for his role as the wizard Vector in the series Wizards and Warriors. Probe has never been released on DVD, although episodes are available, in chunks, on YouTube. (I’d recommend using the link provided, rather than looking for them yourself, because the majority are listed under the specific episode titles and NOT found when doing a search for the Probe TV series.) Those who posted the episodes run a site called Probe Resurrected, home to lots of information about the series, including quotes from various episodes and links to further information, as well as fan fiction and more. Whose genius exceeded all claims. If that’s not a great description of Probe, then you’ll never understand any other. It’s just crazy smart fun. Aired at Friday 8/7 Central? Up against The Cosby Show, it aired on Thursday nights at 8/7 Central. The only mystery Austin James couldn’t solve was how to beat Cosby in the ratings.